The distinguished former NC Poet Laureate, Joseph Bethanti, who judged the submitted poems, has chosen the winners of the Second Annual James Larkin Pearson Poetry Competition. The superintendents of Wilkes and Caldwell Counties have been notified of the winning students even though the places that the students have won were not disclosed. On April 13th at 1:00, the first, second, third and honorable mention places will be announced for high schools and middle schools from Wilkes and Caldwell Counties. Refreshments will be provided by the Culinary Department from the Caldwell Community College and also Whippoorwill Academy and Village. The event is open free to the public and everyone who supports young poets will especially enjoy the program. The judge, Joseph Bethanti is the author of 17 books and is also a recipient of the NC Award for Literature. He is the McFarlane Family Distinguished Professor of Interdisciplinary Education and Writer-In-Residence for Appalachian’s State University’s Watauga Residential College. Much of his poetry has been inspired by his work in prisons. He feels that he is more of a narrative poet and enjoys telling stories. When he was tenured as NC’s seventh Poet Laureate (2012-2014), he taught poetry and creative writing to veterans struggling with PTSD. A few years ago, artists in the area were asked to create works to express poems from his book Concertina at the Caldwell Arts Council. Having Mr. Bethanti as a judge was a great honor and he plans to be present at the Second James Larkin Pearson Poetry Competition on April 13th at 1:00. 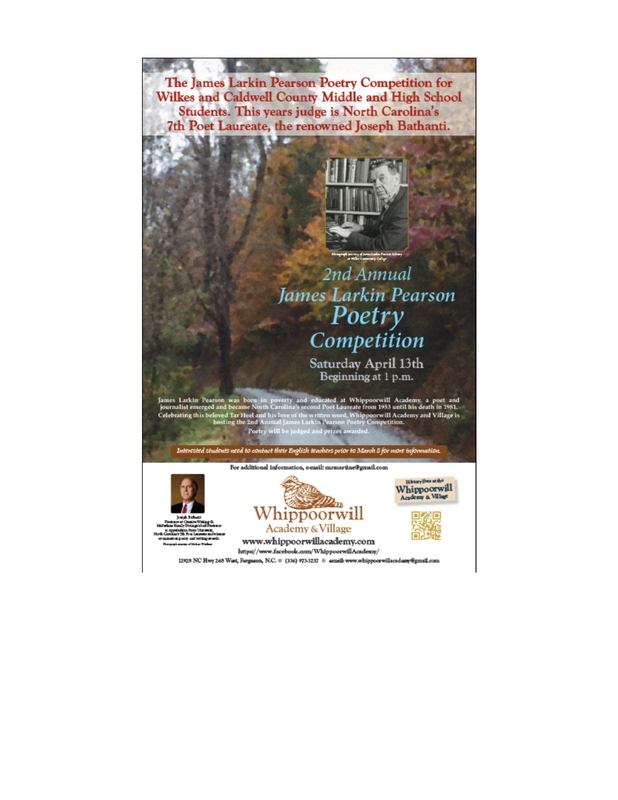 Sponsors for the Second James Larkin Pearson Poetry Competition are: Eliza Bishop; Norma Suddreth; Sarah Akin; Jan Pennell and Reins-Sturdivant Funeral Home. Their contributions are appreciated for making the event possible.